HomeWork: Lessons Learned in the Home for Success in School and Life is written for professionals who work with parents and caregivers as a training resource to prepare them to perform successfully as their children’s primary teachers in the home. The book can be a viable reference for helping parents and caregivers become more competent, capable, and comfortable contributors to their children’s growth and development. HomeWork provides those who work with parents, particularly parents living in poverty, with a framework and set of strategies and tools to increase the intentionality and effectiveness of parents’ efforts to help their children succeed in school and in life. Click here to purchase from Amazon. 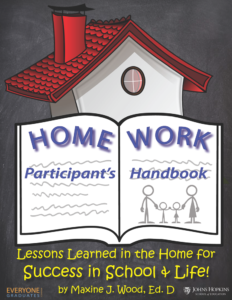 HomeWork’s “Participant’s Handbook” is a companion resource to guide parents’ or caregivers’ individual learning. It includes opportunities for personal journaling, note-taking, and reflecting their input, understanding, and remembrances for the themes in HomeWork. Each chapter consists of four specific components and gives clarity, understanding, and reinforcement as parents participate in and complete their training in HomeWork. Each of the ten chapters contains narratives for the Introspection, Retrospection, Roundabout and Action components as they appear in the HomeWork instructors’ guide. Activities Completed Together (A.C.T.) are provided at the end of each of the ten chapters for parents and caregivers to use at home with their children. Click here to purchase from Amazon. HomeWork: Lessons Learned in the Home for Success in School & Life is a resource book for training parents and those in parenting roles to effectively guide their child(ren) in the “home” ways that support their learning in school and beyond. HomeWork stresses the significance of parents helping their child(ren) focus on areas of behavior, character education, and values they deem important for their growth and development. While HomeWork is not a traditional ‘how-to’ book, it offers clear explanations and practical applications, readying parents for increased success working with their child(ren) at home. HomeWork strives to equip parents well, and build their confidence for success in this role. Through sustained, effective use, HomeWork: Lessons Learned in the Home for Success in School & Life has the potential to broadly impact children’s success as they continue to learn, grow, and develop in school and throughout their lives. HomeWork: Lessons Learned in the Home for Success in School & Life and its companion Participant’s Guides are available at Amazon. HomeWork: Lessons Learned in the Home for Success in School & Life contains many valuable resources. There are also additional resources and downloads available online. Click here if you have purchased a guide and would like to access the online resources. 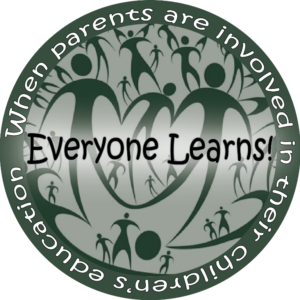 All the resources and support items available for HomeWork: Lessons Learned in the Home for Success in School & Life will be updated frequently. If you would like to receive notifications of updates and resources as they become available, please complete the form below. The information you submit on this form will remain confidential and will not be shared with any other organization. Ms. Wood discusses her new publication, HomeWork: Lessons Learned in the Home for Success in School and Life on WOLB’s show Love & Happiness hosted by Veris Lee. Maxine Johnson Wood is a native of Baltimore, Maryland and a product of the Baltimore City Public Schools. She is a graduate of the College of Notre Dame of Maryland (Bachelor of Arts) and Towson University, Towson, Maryland (Master of Education). Her Doctorate in Urban Education was earned at Temple University, Philadelphia, Pennsylvania. Maxine began her career in public education, as a high school history teacher, at the age of twenty, at Frederick Douglass High School, Baltimore, Maryland. 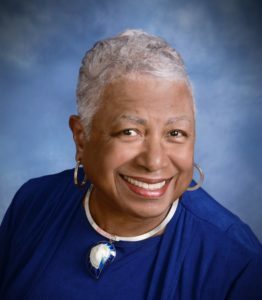 She spent more than twenty years as an educator in the Baltimore City Public Schools, holding positions as a classroom teacher at the middle and high school levels; proposal developer/grants writer; coordinator for specially funded federal, state, and non-local programs; and principal of two BCPSS elementary schools. Maxine joined the Alexandria City Public Schools, Alexandria, VA, as Executive Assistant to the Superintendent in July 1988. She was selected by the City Manager and Superintendent as co-organizer of the “City and Schools Staff Group on Youth,” a unique, pioneering initiative that included representatives from the schools and every city agency working with children and youth. Later, she was promoted to Assistant Superintendent, Executive Assistant Superintendent, and served as the Acting Superintendent of the Alexandria City Public Schools for the 1994–95 school year. Maxine joined the Talent Development High Schools (TDHS) program at the Center for Social Organization of Schools (CSOS), Johns Hopkins University, Baltimore, in December 2001. Maxine was appointed to the Board of School Commissioners, Baltimore City Public Schools, in 2007. She completed her six years of service as Commissioner in 2013. From 2008 to 2014 she served TDS as Chief Operating Officer for Site Development and Operations. In December 2014, Maxine was named Director/Senior Advisor for the Pathways from Poverty Consortium at the Johns Hopkins University School of Education. Maxine believes that her work in public education over many years has prepared her well to assist, serve, and support educators, researchers, and others committed to responding to students’ and families’ needs as they seek viable, effective educational opportunities and academic success.